THE CHALLENGE WCS saves wildlife and wild places worldwide through science, conservation action, and education. However, they need constant financial support to keep going. Our goal was to inspire working people age 25+ to donate to WCS by highlighting the importance of Climate Change and Ecosystem Conservation. INSIGHT People have no urgency when it comes to climate change because they do not think it will affect them in their lifetime or their life style. THE SOLUTION We created a campaign that visualized the real effects of climate change and helped people imagine where the world is heading if they donate and act now. 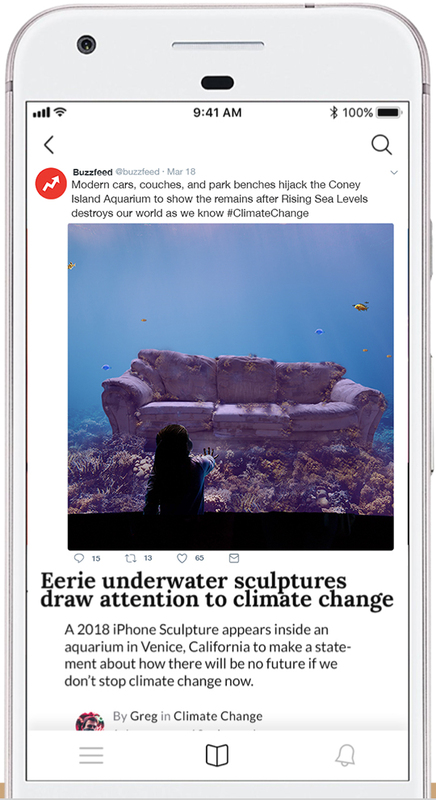 We partnered with the Boston Aquarium to create an installation that showcased the most mundane situations and objects on the seabed of the aquarium. This striking image was created to increase donations and make people think about the consequences of their actions. Coastal cities like New York and Miami face the most risk from the climate change. To show the rapid rise of sea levels, we created an elevator that visually submerged into water, while a digital display showcased striking climate change milestones. The donation kiosk in the lobby encouraged people to donate. People rarely leave their home without checking the weather first. We tapped into this human behavior and partnered with The Weather App to bring striking weather and climate change alerts straight to your phone.